October 2016 | Boating Industry | 23 www.BoatingIndustry.com Yeargin has continued to be heavily involved in improving the entire in- dustry, from writing on a number of key industry issues for Boating Indus- try and other outlets to meeting with government officials to further the industry's concerns. It was that record that caused us to, for the first time in the program's history, recognize a Mover & Shaker for a second time. After being a finalist in 2015, Bill Yeargin is the 2016 Mover & Shaker of the Year. Growth strategy Since Bill Yeargin joined Correct Craft as CEO in 2006, growth through ac- quisitions has been a key goal for the company. While the industry down- turn slowed those plans, the recovery has presented new opportunities as manufacturers look for an exit strategy. "Because of the acquisitions we have done, and the way we have tried to manage them after the acquisition, Correct Craft has become a very desired buyer for companies in our industry," Yeargin said. "We are the anti private equity firm. There are many people in our industry who have owned their company for decades and would like an exit opportunity, but have also seen what can happen when a company is sold to a private equity firm. They want no part of that for their 'baby.'" After an acquisition, Correct Craft has worked hard to recognize the strength of the brands and employees of the companies it acquires. Keeping the previous owners involved helps to make the transition easier and pre- serve the legacy of the new brands. That record has resulted in many own- ers reaching out to Yeargin and Correct Craft when they are ready to sell. "The common thread with the companies we have acquired, as with SeaArk, is that they have great brands, loyal employees, high quality prod- uct, and devoted customers," Yeargin said. "They also had owners who wanted to sell to someone who would respect and protect what they built and we try hard to be that kind of buyer." Even with its growth from one brand to 12, Correct Craft will continue to look for more opportunities to grow. "I fully expect us to keep making acquisitions," Yeargin said. "Because we have a track record of creating immediate positive results in the com- panies we have acquired we believe we have a model that can continue to impact new companies and build on our success. We will soon be pushing $400M in annual sales and I expect that through optimizing our current companies and new acquisitions we can double that over the next several years." Promoting the industry Beyond Correct Craft, Yeargin has worked on a number of the industry's key issues from international trade to promoting manufacturing in the United States. He has, for example, been a vocal supporter of the Trans- Pacific Partnership, saying it will help grow the boating industry globally based on his experiences traveling to more than 100 countries. "I have seen firsthand the growth around the world and what other countries are doing to compete with the U.S.," he said. "Many times when I travel to another country I meet with government officials and they always ask what they can do to get Correct Craft to start building boats in their country." That's why it's important to make changes today. "We need to make the right investments now in infrastructure to make sure we can compete in the years ahead," he said. "We need free trade and agreements that allow U.S. companies to compete on an equal footing. We need common sense tax reform that does not increase our deficit but allows U.S. companies who make their money overseas to bring it back home." Yeargin has also been a big proponent of National Manufacturing Day and other efforts to promote manufacturing as a career. "A year or more ago I was in a meeting with about 20 boating industry CEOs and we went around the room and each of us shared our biggest problem," he said. "I would guess at least 15 of the CEOs said getting good workers was their biggest challenge. The challenge of finding good workers is only going to get worse the next 10 years and we need to start working to solve this problem today. Manufacturing Day can introduce lots of young people to our industry and I strongly encourage everyone in our industry to participate." Through his work on these issues, Yeargin has had the opportunity to talk with government officials from President Obama to the secretaries of commerce and the treasury. He is also a member of the Manufacturing Council, a group of 25 business leaders who advise Commerce Secretary Penny Pritzker. Culture counts One of the key factors in the success of Correct Craft has been the com- pany culture. "'Making Life Better' is not just a tagline for us, it is our core philoso- phy," Yeargin said. "As I walk through the facilities of every one of the companies we have acquired employees come up to me and thank me for the changes Correct Craft has brought to the company." The best companies have to know why they exist – and for Correct Craft that is why "Making Life Better" is so important to the culture. "We want to make life better for our employees (and their families), dealers, vendors, customers and many others including those we only meet once in a third world country." An important part of that culture is the "Nautique Cares" program at Nautique, which Yeargin started shortly after he arrived at the company. 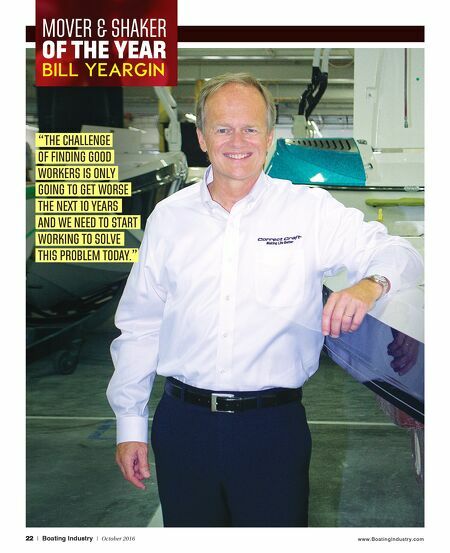 Yeargin wanted the company to have a higher mission than just building boats and making money. "I wanted us to use our platform and resources to help people who need us," he said. Through the Nautique Cares program, the Correct Craft team has worked on service projects both locally and globally. Employees have traveled to a number of countries, including Cambodia, Ethiopia, India, Uganda, Kenya, the Caribbean and many others to build houses for home- less families, serving schools and orphanages, feeding the hungry, fighting human trafficking and supporting other organizations. "We want to serve others and it is expensive but the impact on our culture is immeasurable," Yeargin said. "Our employees know we care and the people who go on these trips are impacted forever. Even the employ- ees who do not go on the trips are impacted as they hear the stories and realize they work for a company that does care. I regularly have people (both inside and outside of our company) tell me our culture is like none they have ever experienced or seen, and while there are many things that impact the culture I doubt there is anything that impacts more than our commitment to service."